I like a nice big expensive gaming headset as much as the next gamer, but sometimes you want to go for portability, adaptability, and affordability. It’s easy to scoff at what might seem to just be a cheaper option, but sometimes the price is right for a set of great features. GNA sent me their pilot product, the GNA Nomad-1, for review. After almost two weeks of using them for everything from music to phone calls to gaming, I can safely say that this unique hybrid of earbuds and gaming headsets has become one of my quick go-to options for headphones in many applications, especially portability. From a build standpoint, the Nomad-1 headset has a high quality look and feel. The actual earbud portions aren’t overly large, but still have an almost futuristic appearance to their design. Adorning the side is a brushed metal red disc emblazoned with a polished G. Pictures don’t really do it justice. Red covers the pieces that go in your ears, as well as accenting where the cable meets the earbud. A detachable boom mic also has red accents and a bendable metal design so that you can perfectly position it while chatting. The Nomad-1 uses standard rubber cabling. I would have liked to see braided cable round out the design. Rubber cabling will often retain kinks, bends, and folds, and the Nomad-1 is no exception. Those problems are no greater than any other set of earbuds that use rubber cables though, so while the braided cables would have been nice, it’s a not a huge downside, especially considering the price and rest of the features. Where cheap earbuds often have a cheap fit, the GNA Nomad-1 headset is specially designed to fit snugly in the ear, while the ear hooks help to disperse the pressure and make them comfortable to wear for long periods of time. If the default size doesn’t work for you, there are three different sizes included in the box of both the earpieces and ear hooks. They can be mixed and matched to fit nearly any size of ear. I normally don’t like wearing earbuds for extended times, but I never found my ears getting sore after wearing these ones for a few hours at a time. A comfortable headset doesn’t matter much if the sound quality doesn’t hold up. Fortunately the GNA Nomad-1 in-ear headset performs admirably in its price range. While it’s not going to compete with the professional gaming headsets in far higher price ranges, GNA isn’t trying to compete with them. Instead, they are tackling a market of affordability and portability. People want quick and easy chat options, and with its detachable boom mic and carrying bag, it offers just that. Plugging in the boom mic defaults voice chat to that, while detaching it switches over the inline mic on the audio controls. The boom mic is better quality for voice chat, but it’s really nice that there are options. As an audiophile, the audio balance of the headphones scoops out the mids. In music, this term refers to boosting the levels of the lows and highs in the mix, while dropping the level of all of the mids. It’s a quick and dirty method of making audio sound good to the untrained ear. Booming bass and crisp high end sounds great at a glance, but closer examination reveals a lack of clarity in much of the audio. Portions with a lot going on can get muddied and confusing. Again, this is the type of thing that only someone who has worked in the audio industry for more than a decade might notice, and GNA isn’t marketing the Nomad-1 to those people. One of the biggest problems I actually have with a lot of headsets is the lack of an ability to monitor your own mic audio, but it’s particularly egregious in a set of in-ear headphones designed for secure fit and noise isolation. Mic monitoring is a feature that’s often reserved for far more expensive headsets, and even then, many products north of $100 don’t even have the ability hear yourself. While it’s something I noticed, it’s not a feature that I would expect out of an affordable and portable option like the Nomad-1. In fact, what I would hope is that consoles and voice chat providers would build mic monitoring in at the software level instead of relying on the headset manufacturers to do it. 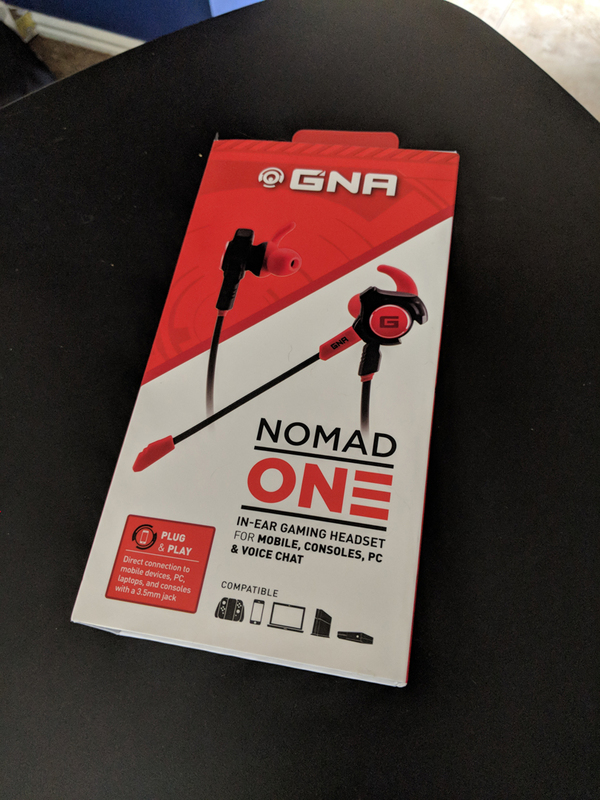 At the time of this writing, GNA has a sale on the Nomad-1 going for $29.99, but even at the normal list price of $49.99 the GNA Nomad-1 in-ear gaming headset is a great pair of earbuds for any use. It works with any 3.5mm jack, so it works with everything from mobile devices, to computers, to consoles. If your PC runs on a split mic and headphone inputs, the package includes a splitter to allow you to use the Nomad-1 with your computer. While at home I still prefer to use my higher-end gaming headsets, but if you don’t have one available or just want a more affordable option, the Nomad-1 is a selection that shouldn’t be overlooked. Despite not actively using it for my living room gaming, I’ve come to use the Nomad-1 headset in portability over all other earbuds that I own. They’ve accompanied me on a couple of flights for music and movies, helped me make and take a few phone calls, and even been nice for gaming at home when I don’t feel like wearing a bulky set of headphones. If you’re looking for a solid and comfortable pair of affordable earbuds for nearly any use, you’ll want to get the GNA Nomad-1 in-ear gaming headset on your radar right away. 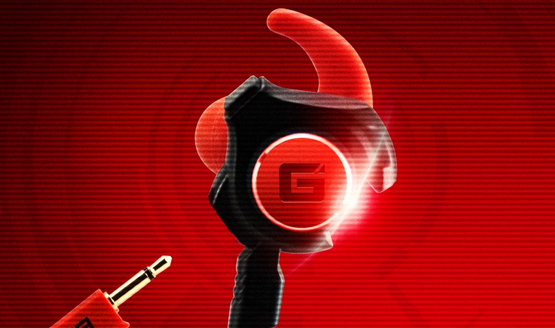 GNA Nomad-1 in-ear gaming headset review unit provided by the manufacturer for the purposes of this review. For more information on scoring, please read our Review Policy.